Pizza crust, until now, has been a culinary mountain I've failed to climb. Whenever I've tried to make it at home (either from scratch or with store-bought dough), something's gone wrong. I repeat...until now. This dough recipe, from the Big Sur Bakery Cookbook, is literally perfect. It couldn't be easier to work with, and it tastes like heaven. This is the kind of recipe that I've been searching for, the one that will undoubtedly become a permanent kitchen staple. One that I forsee providing hours of endless fun. The toppings on the pizza were-- forgive the cliche-- the icing on the cake. 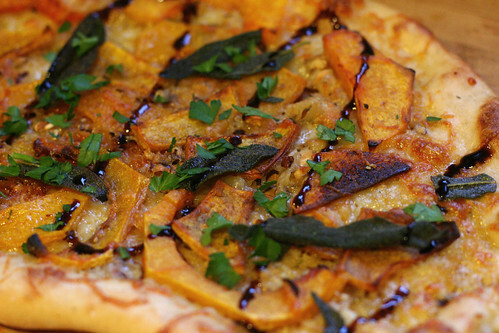 Roasted butternut squash. Fried sage. Lemon. Parsley. Hazelnuts. Cheese. Garlic oil. Heavenly. I topped my pizza with balsamic glaze because I had some handy, but it's not necessary to achieve the full effect. Head on over to Beyond Ramen for the Dough Recipe, or feel free to use your favorite dough instead. Just a heads up, if you do make this, that the dough requires some foresight. Prep it at least a day in advance, I promise it's worth the wait! 2. Slice off the top of the squash about 1/2 inch under the stem, and slice just enough off the bottom to remove the remnants of the withered flower stem; be careful not to cut into the seed cavity. Split the squash in half crosswise just above the bulge. Stand each half end up and carefully cut away all the skin. Cut each portion in half lengthwise, and scoop the seed and fiber from the lower half with a spoon. Cut the quarters cross-wise into 1/4-inch slices. The upper portions will yield half-moon slices, and the lower sections elongated C shapes. 3. Brush the slices with olive oil, season with salt and pepper, and arrange them in one layer on a baking sheet. Roast in the oven for 30 to 60 minutes, checking from time to time. The roasting time will vary according to the sugar and moisture content and the density of the squash. It is done when lightly browned and tender to the touch. 5. Roll out a circle of pizza dough, brush with the olive oil and garlic, and sprinkle evenly with the mozzarella and Gruyere. Arrange the slices of cooked squash over the cheese. Bake the pizza or about 10 minutes, until the crust is browned and the cheeses have melted. 6. While the pizza is baking, chop the parsley leaves. Fry the sage leaves briefly in hot olive oil, then drain them on an absorbent towel. When the pizza is done, garnish with the sage leaves, the chopped parsley, a squeeze of lemon, and hazelnuts and balsamic glaze if desired. homemade pizza is magnificent for those instances when one is craving pizza with interesting toppings not drowning in a puddle of grease. i love your crust (congrats!) and your cheeses, nuts, and squash look and sound perfect! Woo hoo, thanks for the linky love! :) I continue to be amazed at just how awesome that pizza dough is. Yum Yum Yum,...what a georgous & tasty looking pizza!